It provided full mission real-time computer-based simulation facility capable of supporting advanced training in navigation, seamanship, maneuvering and the operation of vessels under normal and potentially hazardous conditions. Six degree of freedom hydrodynamics. Real-time, accurate response to ship controls (engine, rudder, and thrusters). Special environmental effects on own-ship motion such as wind, current and sea state. Accurate interaction with piers, mooring lines, anchors and tugs. The system provides realistic images with 360-degree field of view, full mission bridge equipment, navigation suite and provides ship movement in three axes with utilizing six degrees of freedom hydrodynamic and visual motion. Integrated Bridge System (IBS) is comply with IMO resolution MSC.64(67), annex 1, of the International Maritime Organization (IMO), and other relevant IMO performance standards, in order to meet the functional requirements contained in applicable IMO instruments, not precluding multiple usage of equipment and modules or the need for duplication. The system provides a better insight into capabilities and limitations of powerful and high maneuverable Tugs. It’s improve the practical knowledge of handling modern steering devices , various types of propulsions and towing operations best practice .The system provides training on : Voith Schneider (VS) Tractor Tug , Conventional Tug , Azimuth S tern D rive Tug (ASD), Pusher Tug and River T owing Tug. The system develops skills to handle and utilizing the best practice in different types of boats at various circumstances and different harbor operations. It’s also provides small fast ships up to 60 knots speed for training authorities such Coast Guard Patrolling, Search and Rescue and Recreational Fast Boats. Provides training for operators and supervisors working in vessel traffic service stations and support pillar for the training and it quickly become evident that one of the most important aspects of any new program is the careful scheduling of knowledge elements in conjunction with simulation exercises specifically designed to apply these elements. Traffic model with which realistic sailing behavior and typical maneuvering character is tics of vessel can be created, with the final objective of facilitating the simulation of realistic traffic situations. A worldwide library of Electronic Navigation Charts (ENCs) and ARCS worldwide. Chart update system to update/correct paper & Electronic Navigation Charts and ARCS (ChartCo Service). An ECDIS station installed in the Fast Boat Simulator to comply and upgrade the system integration data and is connected to the 10 ECDIS stations in the ECDIS lab. To apply real time simulation for training purposes. The ISC hosts 6 Mini-Bridges, manufactured by TRANSAS, installed in 2015. The Bridges contains all navigational equipment to operate all SOLAS type ships irrespective at size and tonnage. In addition to special purpose vessels, like DP, Offshore supply vessels, ASD tugs and high speed crafts. The systems are designed to meet the purpose of STCW mandatory training, Radar, ECDIS and all aspects of shiphandling competencies on all types of ships. The Bridges have a view of rotatable 120˚ and a sound system which increases the liability of the system in general, loading to a better and higher quality simulator education. It is a training facility meeting room. It provides visual representations of ship operation and control parameters for review, analyze, discussion and report about trainees performance. There is a possibility of attaching more than one simulator up to the whole marine simulators in one exercise to practice an integrated training. During simulation exercises all environmental factors can be controlled such visibility (clear &restricted), sea state, wind direction and current condition (speed and direction) and sailing time (daylight, night time) to achieve training in response to heavy weather. 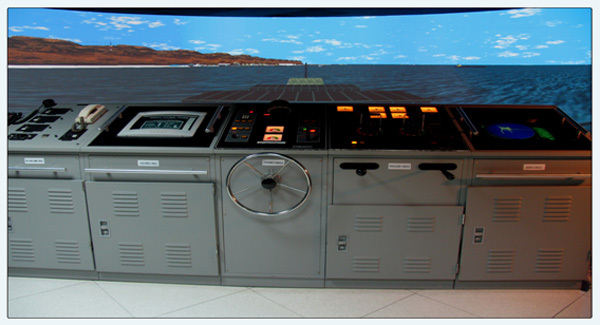 The Marine Simulators systems with data Input stations will allow instructors to develop databases and build any port, quay and geographical area of any country in the world required for training. Beside these more than 18 geographical areas are already available for training like Alexandria port, Damietta port, Dekheila port, El Sukhnah port, and Port Said East Port, Singapore port, United Arab of Emirates ports (Khaled port, Khrfakhan port, El Hamerya port, and El Fujairah port). 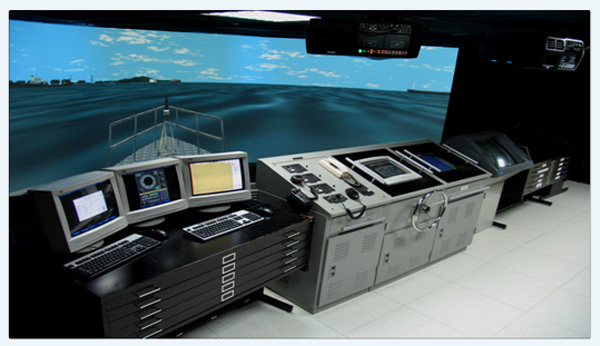 Marine simulators fleets provide more than 80 Ship Dynamic Models varies between bunker barge 5 KDWT up to VLCC 300 KDWT with different loaded conditions that can be applied to all simulation exercises (simulation scenarios). A) Examining proposals for new berths or ports. B) Testing against specific combinations of meteorological Conditions (Wind- current -sea state). D) The operational needs and contingency plans for new ship type and Size can be investigated on the simulation. Strains on ship mooring lines. Different bank, channel interaction effects. Different recommendation cover issues like suitable tugs power, optimum mooring methods, and optimum vessel speed inside the port.